CXR shows bilateral symmetrically enlarged hilar and mediastinal lymph nodes. CT (Fig. 11.2) confirms this finding, typical of sarcoidosis. The main differential diagnoses would be lymphoma and tuberculosis, but the lymphadenopathy would then be asymmetrical. Bronchoscopy and transbronchial lung biopsy are positive in 60 of cases, showing non-caseating granulomas and culture negative for tuberculosis and fungus. Blind endobronchial biopsies increase the yield by another 20 but the gold standard is mediastinoscopy. Incidence in people of African origin is ten times higher than in Caucasians. Sarcoidosis presents as a periarthritis or polyarthritis associated with hilar adenopathy, erythema nodosum, and fever (Lofgren syndrome). A similar disorder can occur without adenopathy and can be due to infections (streptococci, TB, coccy), inflammatory bowel disease, and drug reactions. Specific types of infections give rise to granulomatous inflammation. These include tuberculosis, sarcoidosis, cat-scratch disease, leprosy, brucellosis, and schistosomiasis (49, 50). A granuloma is identified by its distinctive pattern of inflammatory reaction in which aggregates of epithelial-like macrophages are surrounded by lymphocytes and a few plasma cells. Older granulomas also display an outer layer of fibroblasts and connective tissue. In some cases, fused macrophages, giant cells, are also found (49). Protocol 19 describes the isolation of granuloma macrophages (51) from livers or lungs (52) of infected mice. Patients usually have normochromic, normocytic anemia, leukocytosis, thrombocytosis, and an elevated ESR. WG, in contrast to the immune complex vasculitides, is associated with antineutrophil cytoplasmic antibody (ANCA), especially c-ANCA, which has a 98 specificity but a 30 to 99 sensitivity. Titers are usually associated with disease activity consequently, only 30 to 40 of patients with limited WG or generalized WG in remission have c-ANCA positivity. A small minority (5 ) can be positive for p-ANCA also. 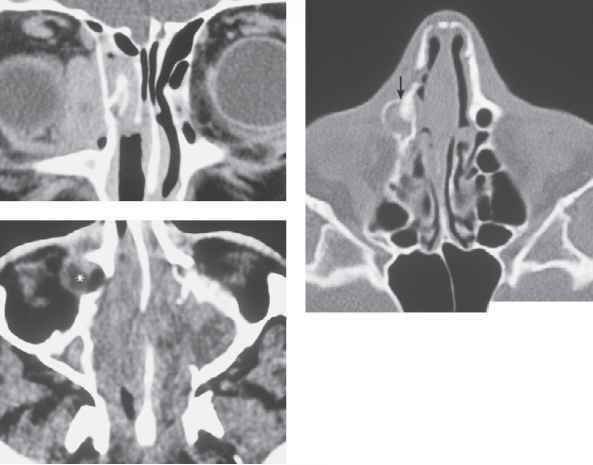 The limited form of the disease can be difficult to diagnose on clinical grounds, and the presence of c-ANCA may strongly influence the diagnosis. The strongest diagnostic evidence nonetheless comes from biopsy specimens of the involved tissues, which show granulomas. Lymphomatoid granulomatosis and necrotizing sarcoidosis may be confused with WG. The causative agent(s) leading to granuloma formation are unknown. The CXR shows a right upper lobe ball within a cavity (air crescent sign) patho-gmonic of a mycetoma (also called aspergilloma). A lateral decubitus X-ray may demonstrate the fungal ball shifting position. In this condition, a preformed cavity becomes colonized, usually by the fungus Aspergillus fumigatus. 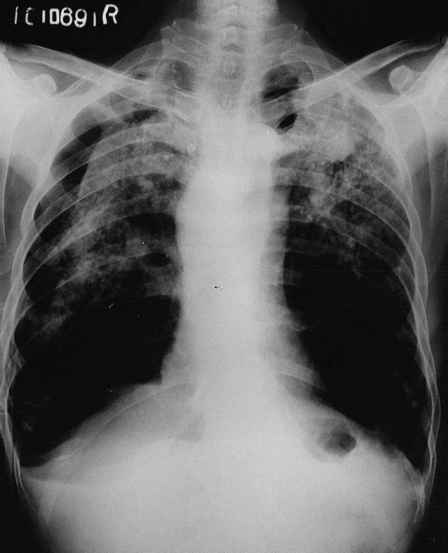 Cavitary disease may be secondary to fibrotic lung disease, e.g. previous tuberculosis, sarcoidosis, or ankylosing spondylitis. Massive hemoptysis can result and bronchial angiogram with embolotherapy (using coils or gel foam) is temporizing. Surgical resection is definitive, but bronchopleural fistula may result. Unfortunately, most patients have insufficient pulmonary reserve to allow surgical resection. The CXR shows narrowing of the tracheal air column (Fig. 61.2) with calcification of the wall. Tracheal narrowing can be due to malignant causes (lung cancer, lymphoma, metastases) or benign causes (post tuberculosis, posttraumatic, amyloidosis, sarcoidosis, Wegener's, Tracheopathia Osteochondroplastica). 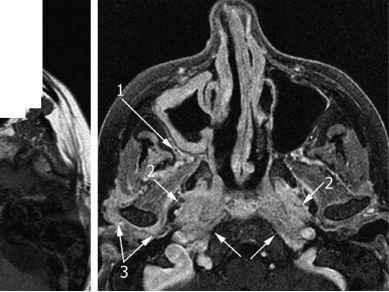 Tracheopathia Osteochondroplastica (TO) is an extremely rare condition, characterized by the presence of multiple osseous and or cartilaginous submucosal nodules (Fig. 61.3) protruding into the lumen of the airway. Bronchoscopy is diagnostic but treatment is nonspecific and supportive. The most common cause of VT is reentry through regions of scar, most commonly an old MI (Fig. 4). Other scar-related VTs occur because of arrhythmogenic right ventricular dysplasia, sarcoidosis, Chagas' disease, and other nonischemic cardiomyopathies. 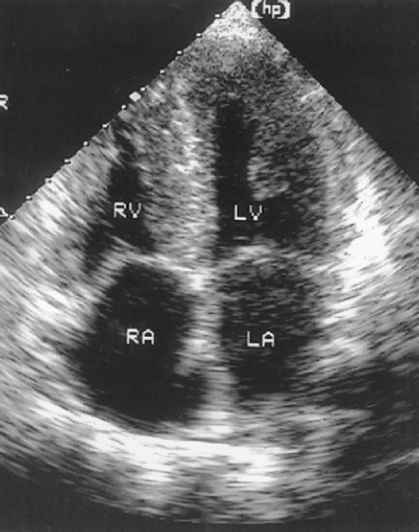 Two features of ventricular scarring lead to reentrant VT (40-42). 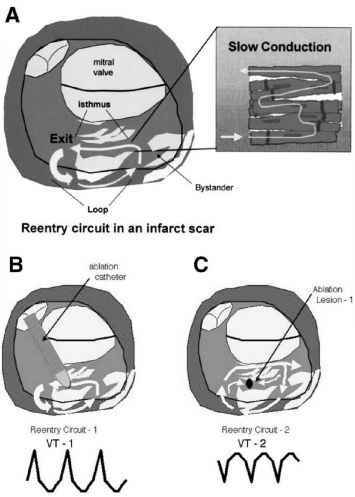 First, dense scarring creates regions of anatomic conduction block. Second, the scar is not comprised completely of dense fibrotic tissue, but also contains surviving myocyte bundles (43,44). Fibrosis between myocytes and myocyte bundles decreases cell-to-cell connections. The excitation wavefront propagates in a zig-zag manner from myocyte bundle to myocyte bundle, increasing the time for depolarization to procede through the region and thereby causing slow conduction (44). Circulation of an excitation wavefront around an area of block leads to reentry. With slow conduction, each cell in the circuit has sufficient time to recover after each depolarization. The second patient group has reduced numbers of B cells and defects in the synthesis of IgG and IgM. 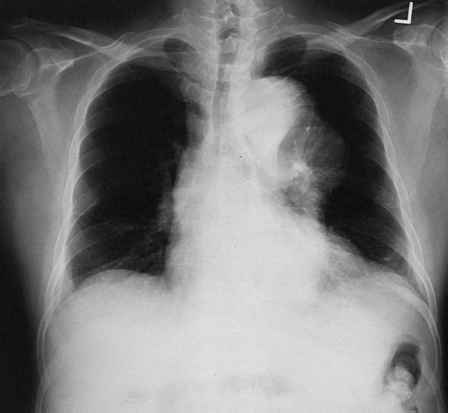 These patients present with granulomatous disease resembling sarcoid. Granulomata may be found in the spleen, lymph nodes, lungs, skin, and brain. The histology is characteristic ofnoncaseating epithelial granuloma (Spickett et al., 1990). 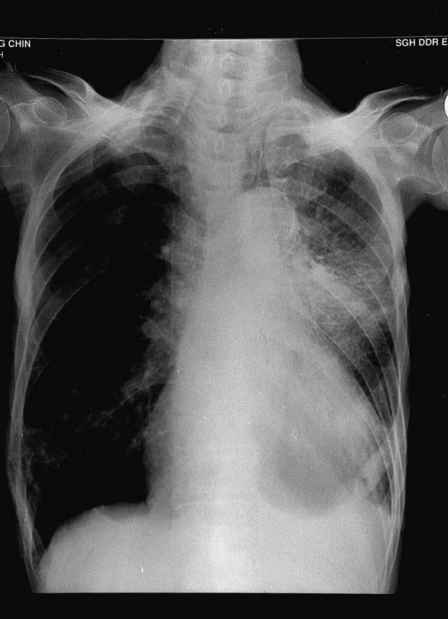 The CXR shows asymmetric distortion of the mediastinal contour by markedly enlarged lymph nodes overlying the left hilum. 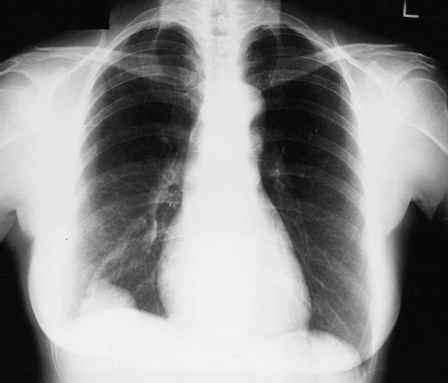 This is described as the hilar overlay sign - the normal left pulmonary artery (Fig. 36.2) is seen through the mass (lying at the anterior mediastinum). Other differential diagnoses include chronic lymphocytic leukemia, sarcoidosis, Castleman's disease, and granulomatous disease like tuberculosis or histoplasmosis. The histology from mediastinoscopy in this patient showed Non Hodgkin's lymphoma. Muscle biopsies in small numbers of sarcoid patients without symptoms of muscle pain or weakness have revealed noncaseating granulomas typical of the disease. The occurrence of asymptomatic muscle involvement has clouded the issue of whether a true sarcoid myopathy exists. Nonetheless, there are sarcoid patients with symptomatic muscle involvement. Muscle pain and tenderness are most often seen in acute sarcoidosis with erythema nodosum. Symmetric proximal muscle weakness can be seen in chronic sarcoid (see Chapters. ). Aneurysms of the cavernous sinus, as well as infectious (bacterial or fungal abscesses, tuberculosis, and toxoplasmosis) and inflammatory processes (sarcoidosis, giant cell granuloma, lymphocytic hypophysitis, and histiocytosis X) can mimic a pituitary adenoma, causing mass effect and hypothalamic-hypophyseal endocrine dysfunction secondary to infiltration of normal tissue (91). Pyoderma gangrenosum is frequently associated with ulcerative colitis, Crohn's disease, RA, myeloproliferative disorders, and leukemia. Rarely, it is associated with chronic active hepatitis, myeloma, sarcoidosis, and diabetes mellitus. It begins as a tender pustule that rapidly expands to become a large ulcer many centimeters in diameter with a bluish, undermined border and a necrotic, purulent center. Lesions most frequently occur on the legs and trunk and heal with scar formation. Cutaneous trauma may exacerbate existing ulcers or cause the formation of new lesions. The CXR shows bilateral infiltrates and calcified nodules in both upper lobes. Differential diagnoses of upper lobe infiltrates include silicosis, tuberculosis, and ankylosing spondylitis. There is also egg-shell calcification of the hilar lymph nodes. The egg-shell calcification plus the upper lobe nodules are typical of silicosis. 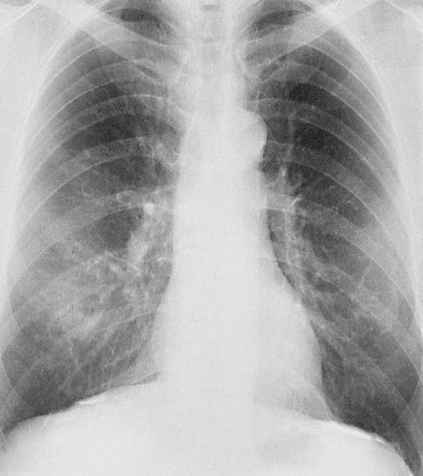 Differential diagnoses of egg-shell calcification include sarcoidosis, Hodgkin's lymphoma following radiotherapy, and coal-worker's pneumoconiosis. Otitis externa is generally caused by organisms such as Staphylococcus aureus and Pseudomonas aeruginosa. Malignant otitis externa is almost always due to P. aeruginosa (see Table 1). Only rare cases of malignant otitis externa due to S. aureus (6), Proteus mirabilis (7), and Aspergillus fumigatus (8) have been reported. Rare causes of chronic otitis externa include tuberculosis, fungal infections, syphilis, yaws, leprosy, and sarcoidosis. Fungal otitis externa may be part of a general or local fungal infection Aspergillus spp. are responsible for the most cases (9).